Milk Protein Isolate, Whey Protein Isolate (Milk), Alkalized Cocoa Powder, Non-Dairy Creamer, (Sunflower Oil, Maltodextrin, Sodium Caseinate (A Milk Derivative), Mono- And Diglycerides, Natural Tocopherols), Oat Fiber, Natural And Artificial Flavors, Sunflower Oil, Medium Chain Triglycerides, Xanthan Gum, Potassium Chloride, Soy Lecithin, Acesulfame Potassium, Silicon Dioxide (Anti-Caking Agent), Sucralose, Stevia Extract. Mix 1 scoop (39g) of Monster Blend™ with 8 fl-oz of water. Monster Blend™ can be used either before workouts, after workouts or prior to bedtime. Individual nutritional requirements vary depending on gender, body weight, level of activity and exercise/training intensity. This product complements a smart eating and hydration plan that, in conjunction with a balanced exercise program, may contribute to weight management and recovery from exercise. During exercise and use, maintain an adequate state of hydration. Mix 1 scoop (39g) of Monster Blend with 8 fl-oz of water. 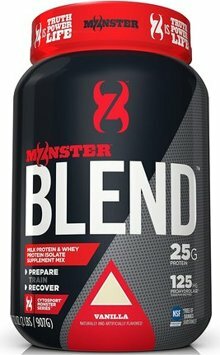 Monster Blend can be used either before workouts, after workouts or prior to bedtime. Milk Protein Isolate, Whey Protein Isolate (Milk), Natural and Artificial Flavors, Non-Dairy Creamer (Sunflower Oil, Maltodextrin, Sodium Caseinate (A Milk Derivative), Mono- and Diglycerides, Natural Tocopherols), Oat Fiber, Sunflower Oil, Medium Chain Triglycerides, Xanthan Gum, Potassium Chloride, Soy Lecithin, Acesulfame Potassium, Silicon Dioxide (Anti-caking Agent), Sucralose, Stevia Extract. Mix 1 scoop (36g) of Monster Blend with 8 fl-oz of water. Monster Blend can be used either before workouts, after workouts or prior to bedtime. Milk protein isolate, whey protein isolate (milk), alkalized cocoa powder, non-dairy creamer (sunflower oil, maltodextrin, sodium caseinate (a milk derivative), mono- and diglycerides, natural tocopherols), oat fiber, natural and artificial flavors, sunflower oil, medium chain triglycerides, xanthan gum, potassium chloride, soy lecithin, acesulfame potassium, silicon dioxide (anti caking agent), sucralose, stevia extract. Mix 1 scoop (34g) of Monster Blend with 8 fl-oz of water. Monster Blend can be used either before workouts, after workouts, or prior to bedtime. Individual nutritional requirements vary depending on gender, body weight, level of activity and exercise/training intensity. This product complements a smart eating and hydration plan that, inconjunction with a balanced exercise program, may contribute to weight management and recovery from exercise. During exercise and use, maintain an adequate state of hydration. Milk Protein Isolate, Whey Protein Isolate (Milk), Natural and Articial Flavors, Non-Dairy Creamer (Sunower Oil, Maltodextrin, Sodium Caseinate (A Milk Derivative), Mono- and Diglycerides, Natural Tocopherols), Oat Fiber, Sunower Oil, Medium Chain Triglycerides, Xanthan Gum, Potassium Chloride, Soy Lecithin, Acesulfame Potassium, Silicon Dioxide (Anti-caking Agent), Sucralose, Stevia Extract. NSF screens supplements for more than 200 substances banned by most major athletic organizations. The main components of NSF certification program are label claim review, a toxicology review to certify the formulation and contaminant review to ensure against contaminants. Patented enzymes can assist with the breakdown and digestion of proteins. A source of both casein and whey proteins. Casein digests more slowly than the rapidly digested whey proteins. Naturally rich in glutamine and the branched-chain amino acids leucine, isoleucine, and valine. Supports the normal digestion of protein which yields peptides and amino acids, the building blocks of muscle protein. This amino acid helps stimulate muscle protein synthesis at the cellular level.